Being an ex-Malaysian and most of my siblings and relatives are still in Malaysia, I am still very much interested in the political development in Malaysia. With the new twist of development in the political scene up there, a new era has began. Finally, the first book that provide an inside account of 1MDB (1 Malaysia Development Berhad, Malaysia's Sovereign Fund) is arrived! Authored by Tim Wright and Bradley Hope (Wall Street Journal reporters) with an apt title of Billion Dollar Whale. It took me less than 4 days to complete this 360+ pages of chronicle recount of events. a true page-turner. Finally, all the dots seem to be joined together. 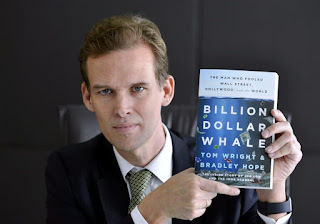 Following are the 5 things I've learnt from Billion Dollar Whale. In whatever you are doing, if your main focus is always on money, sooner or later, you will become "greedy" in getting/amass more money. Of course, not everyone will be as dubious as Jho Low but I think it would be a sad state if all you think about in life is money. There is a saying in Chinese: 穷得只剩下钱！(loosely translated as "Being poor with only money"). Greed will eat you alive by swallowing your soul and emptying your conscientious in no time! And most of the time, there is no turning back. So, before you went into the dark side of GREED, think twice before you are joining Darth Vader. From the recount in the book, if not because of Jho Low's well established networks of liked-minded conspirators (especially those from UAE and well known financial institutions), his scam would not be this "successful". From crazily luxurious parties to mega-yacht to supermodels/socialite and celebrities at your whim, I am sure you will be as happy as Jho Low at that particular moment. However, it is at the expense of your empty-soul as all these happiness are pure transactional. So, if you are looking for true happiness, "give/share" instead of "take/buy"! When you are greedy, you almost always need to tell lie to get more of what you want ; When you lie, greed is almost always your ulterior motive. So, they are good friends in a bad way, please stay far far away from them. Have you read the book? What do you think about the book? Hi Jason, thanks for spotting the error, corrected!